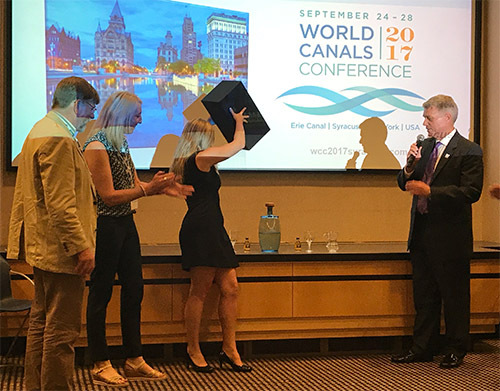 The recent World Canals Conference in Syracuse, NY, was a great success, with more than 350 delegates from 12 countries. I took part in a pre-conference ‘Tour the Towpath‘ cycling rally on September 23-24, followed by IWI’s Annual General Meeting on the Sunday evening, then the four-day conference. There is so much to learn at this annual gathering of waterway authorities and professionals in so many different disciplines, along with connoisseurs, users and enthusiasts. The Conference was hosted by the Erie Canalway National Corridor New York State Canal Corporation and the City of Syracuse. The mix of conference sessions and field trips gave valuable insight into the current state and future development prospects of the Erie Canal, the most ‘European’ of USA canals, which has the city of Syracuse roughly mid way along the 363-mile route from Albany to Buffalo. Why a feel of Europe in upstate New York? Mainly because the three incarnations of the Erie Canal, completed respectively in 1825, 1862 and 1918, are very similar in characteristics to three generations of European waterways, and French canals in particular. The first Erie Canal, built between 1817 and 1825, had dimensions similar to those of the ‘Becquet’ generation of canals in France (27.40 by 4.60m), such as the Brittany Canals. As in England, however, the locks accommodated two narrow boats each 2.20m wide. 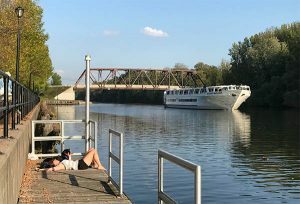 The Canal du Midi, built 150 years before the Erie, was built for single barges slightly longer and wider. The enlarged canal, completed in 1862 (largely along the line of the first) had locks closer to the French ‘Freycinet’ dimensions: 33.50 by 5.50m. Finally the New York State Barge Canal, as it was then called, was like a European Class IV waterway, with locks 100m long and 13.70m wide. The pre-conference tour was a revelation, because it followed the old (enlarged, but abandoned) Erie Canal over a distance of 50km from Lock 21 on the modern Erie Canal through to DeWitt Landing on the eastern side of the City of Syracuse. This was just like cycling along the disused Canal du Rhône au Rhin in Alsace, the section I will be revisiting in just a few days. The trees were just starting their autumn transformation, especially beautiful in this region, and the canal was at least half full, as it is still part of the water supply system for today’s canal, and important also for land drainage. 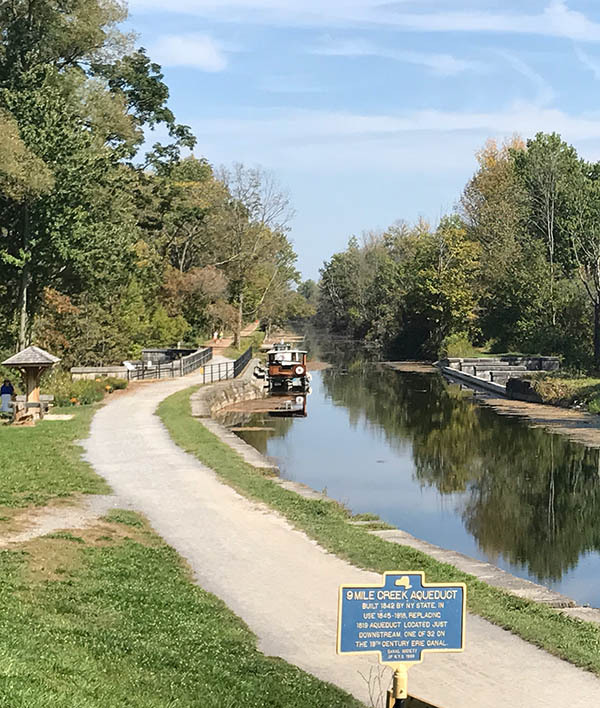 The canal was so picturesque that it was hard not to fantasise about a possible fully restored towpath canal, connecting the main line to the city of Syracuse. The ‘barge canal’ access to Syracuse at the Inner Harbor, north of the city, itself remains to be restored to fully navigable status, after decades of industrial activity and pollution. The clean-up of Onondaga Lake has been a major project for the city over the last two decades, and was the subject of several presentations. Progress was celebrated at a well-attended public event during the weekend before the conference. The conference opened on Monday September 25 with a major announcement by the New York State Canal Corporation’s new owner, the New York Power Authority (a subsidiary of the UK’s National Grid). 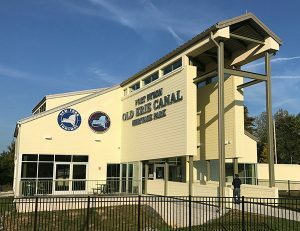 The company’s President and CEO, Gil Quiniones, speaking on behalf of Governor Andrew Cuomo announced a global competition to find the best ideas to ‘re-imagine’ the New York State Canal System, to make it an engine for economic growth upstate as well as a world-class tourist destination. Up to $2.5 million will be awarded to develop and implement the winning ideas. The focus during the four morning sessions was on canals as ‘agents for transformation‘. Speakers from three continents addressed the latest approaches to canal restoration, improvements and expansion. One of the keynote presentations was by Steve Dunlop Chief Executive Scottish Canals on the ‘Transformative power of canals’ in which he outlined the considerable developments that have taken place on Scottish Canals. John Robinson introduced the subject of canals lending themselves to challenges for people with disability. His own challenge, having been born a congenital amputee, was to cycle the entire length of the Erie Canal from Buffalo to Albany. And he’s now done it several times! Patrick Moss from the UK gave a presentation on ‘A new route to Canal Restoration: Floating Communities and Flourishing Heritage’; he introduced the concept of reopening a section of the Somerset Coal Canal. Roger Squires from the IWA spoke about ‘50 years of Restoring Waterways’ in the UK. Sharon Lavin from Waterways Ireland gave an innovative presentation on ‘Blueways- Reimagining Inland Waterways in Ireland’. This offered a foretaste of next year’s WCC which takes place in Ireland, at Athlone on the Shannon, on September 10-12, 2018. Conference delegates were split into three groups for three half days of study visits, in rotation. My group first headed west to see the completed rehabilitation of the amazing Nine Mile Creek Aqueduct on the enlarged Erie at Camillus. We then boarded a boat to discover the Cayuga-Seneca Canal, finishing in Seneca Falls, where conversion of the waterside knitting mill to house the Women’s Hall of Fame is in progress; the day finished with a visit to the new Port Byron Old Erie Canal Heritage Park. The second tour was devoted to today’s working canal, which will celebrate 100 years of operation in 2018; we first visited to the Canal Corporation repair shops at Lysander where canal structures, tugboats, dredgers and other maintenance vessels are serviced. A little further downstream, at Fulton, boarded the Emita II to navigate down the Oswego Canal to Port Oswego. The third tour started at the Erie Canal Museum in downtown Syracuse, with its replica canal boat and rich collection of historic documents and artefacts, then visiting two other revitalised canal sites and communities: the Chittenango Landing Canal Boat Museum and the town of Rome where construction of the Erie Canal started in 1817. For the last morning, the conference moved to the famous art-deco Niagara Mohawk building, now the headquarters of the NYPA, for a final session of presentations and exchanges, during which a panel discussion was held with four young local players who are playing important roles in ‘re-imagining the Erie Canal’. Sharing their experience, they also presented their vision for the canal and its value for their communities in the future. 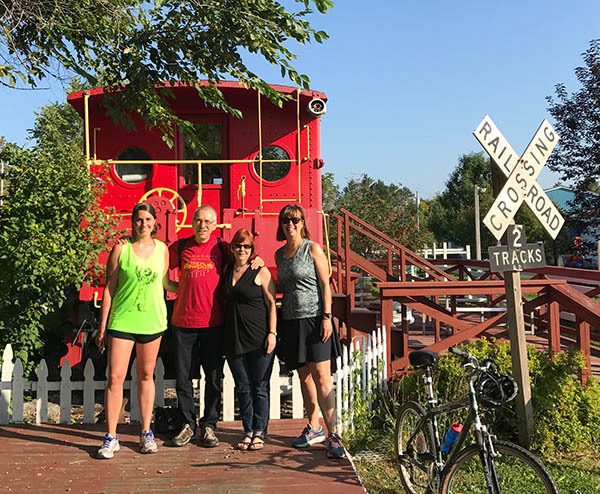 The panel included Sarah Krisch of the Madison County Planning Department, who had organised the ‘Tour the Towpath’ weekend, and Natalie Stetson, executive director of the Erie Canal Museum in the former Weighlock Building in Syracuse. This was an important part of the proceedings, hearing the younger generation speak with such enthusiasm and commitment to the cause of our inland waterways. Canal Corporation Director Brian Stratton has asked his accomplice Dana Kruger to reveal the cask of Erie Canal water, to be taken to Ireland by Sharon Lavin, for Waterways Ireland, and Colin Becker, for the Inland Waterways Association of Ireland. The event closed with the ceremonial ‘passing of the waters’ from the current host to next year’s host. Visit our page presenting next year’s conference. In Canastota, where most of the ‘Tour the Towpath’ cycling group pitched tents for the night of September 23: Sarah Krisch of Madison County Planning Department, organiser of the event; David Edwards-May; Terry Shaler of Bird Brook B&B in Chittenango and Chris Hall O’Neil, Executive Director of the Chittenango Landing Canal Boat Museum.